Little did I know about this fellow Rick Siegel's background as I signed up to "911researchers.com" - a discussion forum that Rick had founded. This was back in late 2006 / early 2007, as I was still working on September Clues v.1.0 (which I first released - on Livevideo.com - on June 5, 2007). At the time, Siegel's forum was one of only two places on the internet (along with Killtown's "911movement.org" forum) to allow any discussions about image fakery, or rather, about "NPT"(No-Plane-Theory") as it was called back then. All I knew about Siegel at the time was that he had produced a (crappy) 9/11 'conspiracy'-movie named "911 EYEWITNESS" - which starred Siegel himself in the guise of a "private citizen who - allegedly - filmed the WTC1 collapse from Hoboken, New Jersey". In fact, Siegel's collapse imagery was - at the time - the ONLY EXISTING supposed "amateur" collapse 'video' with a name attached to it. Yes, there were maybe 2 or 3 other blurry (alleged "amateur") collapse videos circulating back then, but they were anonymous (uncredited) and featured (Steven Rosenbaum's) "CAMERA PLANET" watermark. However, I soon started wondering why Siegel, the "911researchers.com" administrator never seemed to perform any research at all. All he did was posting silly gossip, vapid or/and provocatory comments - and whatnot. But since this was one of only two forums which tackled issues related to my own 9/11 research, I hung around there hoping to get some of my ideas across to its readers - and to learn good stuff from the forum's best contributors. And suddenly, around mid-2007, all hell broke loose... Please stay with me, because this gets pretty funny - knowing what we know today here on Cluesforum. As it happened, Siegel had started viciously attacking the author ("Sophia Shafquat" - aka "Sofia Smallstorm") of another 9/11 'conspiracy' movie, "911 MYSTERIES". Siegel accused Sofia (who had used parts of his purported WTC1 collapse video) of having "tampered with it" (you've gotta love it!... tampering with fake footage!) - and was even threatening her with a big lawsuit ! THIS time, they’ve gone too far. A group of 9/11 conspiracy theorists – whackos who deny that jumbo jets brought down the World Trade Center – is on the attack. But their latest target isn’t the government, which they claim destroyed the buildings with explosives. They’re using a vicious Internet assault to pick on an elderly widow. “They’re dirty sons of bastards! They are not real men,” feisty Ellen Mariani, 69, told me. Ellen lost her husband aboard United 175 on Sept. 11, 2001. The Web site is the work of a Rick Siegel, who hawks DVDs that purport to prove the trade center’s destruction was an inside job. He is partners with Nico Haupt, who is known for sending blistering e-mail rants to trade-center survivors. My attempts to reach both men were fruitless. So who exactly, you may ask, IS this Rick Siegel character? WHO EXACTLY IS this man who claims to have filmed the WTC1 collapse with his own little camera from the shores of Hoboken which, at the time, was the ONLY EXISTING such "amateur footage" claimed by an identifiable person? What is this man's background? Well, please meet the CEO of ONLINE TV, the first online video network broadcasting 24 Hours a day from Europe and the USA using advanced proprietary software and paid membership driven technology. "Online TV Networks CEO Rick Siegel Interviewed on Squawk Box (NBC)"
"Rick Siegel Interviewed On Launch of Windows 95"
Enough said? Hope you all enjoyed this little summary/review - for the historical record. "A LONE BIRD RIDES A HOT THERMAL IN A CIRCLE ABOVE THE DUST CLOUDS"
Make sure to watch it in full screen. It is truly hilarious (or, if you will, very very sad and silly). If this inane video animation doesn't offend your intelligence - NOTHING WILL ! Rick Siegel is a perp - and is now, as far as I know, taking refuge in Spain. He needs to be tracked down - and interrogated. Please keep in mind that Rick Siegel is the guy credited with the ONE-AND-ONLY early-released "amateur footage" of the WTC collapses. ALL the other extant (higher resolution) "amateur WTC collapse imagery" was released months / or years later. In any case, the incredibly poor resolution of Rick Siegel's alleged 9/11 video material is a red flag in itself: to be sure, he wasn't filming with a crappy cellphone camera (since they didn't exist in 2001). And remember: even the first images of the "moon landings" were as atrociously crappy as Rick Siegel's "9/11 videos". AndersLindman wrote: "I would be surprised if it could be shown that the Siegel video is CGI fakery. I absolutely doubt that, but yes to really know for sure such investigation is needed I agree." So, if such investigation is still needed - I will kindly oblige, dear Anders. Here's my (new) contribution to 'the cause'. Please do take the time, however, to read my above descriptions of Rick Siegel - so as to get the 'full picture' of the guy. As for the 9/11 pictures credited to Siegel, there are several problems with them. What we see in the above two frames is nothing that can possibly occur when adjusting any "filter" (or light sensor) of a real video camera. Instead, the black contours lining this city skyline scenery are tell-tale signs, typical of chroma / luma-keying, well-known to anyone familiar with greenscreening tricks in the digital domain. The two frames are instant 'giveaways' telling us that this imagery was computer-generated. Anyone claiming otherwise will have to submit ANY instance where such a phenomenon has occured with a REAL video camera adjustment. Here is a still frame from the above gif loop. Yes, these Hoboken-pier-bystanders DO appear to gaze in the correct (South-East) direction of the WTC (as of Google maps). The problem is, does the WTC itself - as depicted in the above clip - appear to be placed correctly? Or do these folks appear to be gazing in the wrong direction? So what is going on here? Make no mistake: I am not suggesting that what was aired on TV was any more real / authentic than the imagery credited to Rick Siegel. All I am pointing out here are a few absurdities & aberrations which, I hope, will help people realize the utter phoniness of ALL the extant 9/11 imagery - be it credited to "amateur videographers" or to the news media. As you can see, what was aired on TV that day (what with those absurd color schemes, 'dancing' smoke plumes, missing helicopters and whatnot) was no better - nor more credible - than what was later claimed to be "amateur" imagery. I therefore rest my case: NO available 9/11 imagery can be trusted as legitimate footage. It stands to reason that a thick, visually impenetrable military-grade smokescreen was raised around the WTC area, so as to ensure that if ANY REAL / LEGITIMATE amateur footage of the day were captured on film (in spite of possible electromagnetic HERF measures selectively disabling any camera / video electronics in the area) - it would only show Lower Manhattan engulfed in smoke - and little else: no details of the various tower collapses was recorded on film - as they were 'safely' demolished behind a smokescreen - the oldest & simplest trick in the military 'warfare-deception book', if there ever was one. Anders, do you still think that Rick Siegel's 9/11 "footage" is real and legit? I thought we made it clear we don't do 'hit and run' posts with links/URLs/videos. Sorry, but this needs to explained with your own words if you think it's legit. Especially if it's coming direct from Goldengooseegg. For my part, I have looked at the Rick Siegel video very closely so you'd better make a very good case for make up or digital altering, since they don't look a bit alike, and everyone has veins on their arms. It´s none of my business, but I believe Farcevalue was posting the montage as an example of how DGB tries to lead potential researchers away from important lines of investigation by waving shoddy photographic comparisons before their eyes. But I am glad the image was removed. It was giving me the creeps. 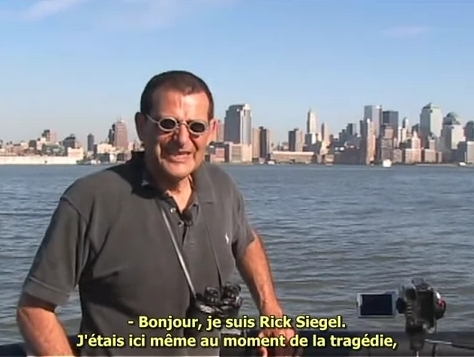 Another strange thing about the Rick Siegel video "911 Eyewitness Documentary" is that when they show him in his own video, he fades in on a still picture, as if to conserve the number of images in the moving video. This could be a rather obnoxious process, depending on the video software, don't you think? Rather than merely having lots of video to take 'takes' from, they act as if each segment featuring this "Rick" character is a precious commodity that they want to show every single frame of. It's almost as if a military supervisor had gone over each frame and "approved" a limited number of sequences. Flabbergasted wrote: It´s none of my business, but I believe Farcevalue was posting the montage as an example of how DGB tries to lead potential researchers away from important lines of investigation by waving shoddy photographic comparisons before their eyes. I thought the comparison to be so ridiculous as to require no further explanation. It was posted as an illustration of the well poisoning tactics used by well aware to lead the curious away from discovering that actors are used in psyops, but not famous easily recognizable celebrities who have already achieved fame in their own right. And yes, it is a creepy image. Let's change the title of this thread from '... unforgettable ...' to '... unforgivable ...'.